The PKK terror group's Syrian offshoot People's Protection Units (YPG) is continuing to target civilians in Turkey's border provinces of Hatay and Kilis. The terror group carried out 90 attacks in the provinces in the last two weeks from Syria's Afrin region since Turkey launched Operation Olive Branch with the aim of clearing the terrorists from Afrin. A total of seven people, including a Turkish high school student and two Syrian nationals, lost their lives in the attacks and 107 people, including children, were wounded. 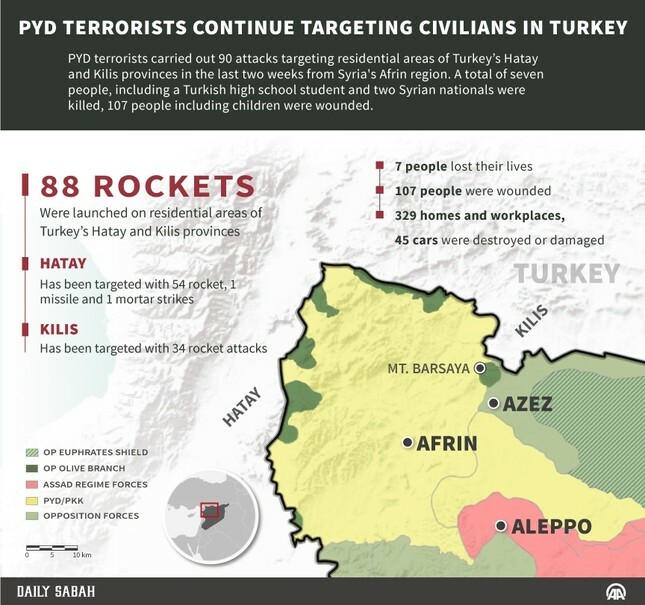 Out of the 90 attacks, 88 were rocket attacks, one was a missile attack and another was a mortar shell directed at civilians in Turkey; 34 of these attacks took place in the city center of Kilis, while 56 were carried out in Hatay's Reyhanlı, Hassa and Kırıkhan districts. Teenager Fatma Avlar, 51-year-old Syrian asylum seeker Nader Al Fares, Rıfat Sinirli and Ahmet Şanverdi were killed during rocket attacks in Reyhanlı, while Şahin Elitaş, a 30-year-old Turkish Electricity Distribution Company (TEDAŞ) worker, was killed in the mortar attack on Kırıkhan; 68 others were injured in the incidents. In the attacks on Reyhanlı, 320 houses or businesses were damaged while 33 vehicles became unusable. Kilis was hit with 34 rockets, killing Muzaffer Aydemir, 72, and Syrian Tariq Tabbaq, 28; 39 others were wounded. The attacks on Kilis left nine houses, a mosque and 12 vehicles destroyed. Turkey launched Operation Olive Branch on Jan. 20 along with Free Syrian Army (FSA) to clear PYD/PKK and Daesh terrorists from Afrin. Since the start of the operation, the PYD/PKK has carried out cross-border attacks on Turkey by firing rockets on civilian neighborhoods. Turkey's Presidential Spokesperson Ibrahim Kalın told the Daily Sabah that the while Turkish forces immediately respond to such attacks, they can't respond to attacks from Afrin because the terrorists deliberately launch the rockets from residential areas. Kalın said that Turkey carries out the operation with utmost care to avoid civilian casualties, but PKK's acting leader Murat Karayılan ordered from PKK headquarters in northern Iraq's Qandil Mountains that the terrorist group should step up propaganda of civilian casualties to tarnish Turkey's image globally. According to the Turkish General Staff, Operation Olive Branch aims to establish security and stability along Turkish borders and the region as well as to protect Syrians from terrorist oppression and cruelty. The operation is being carried out under the framework of Turkey's rights based on international law, UN Security Council resolutions, its self-defense rights under the UN Charter, and respect for Syria's territorial integrity.